Somewhat overshadowed by Wednesday's big iPhone and Apple Watch product announcements, Apple announced its fledgling payments service, Apple Pay, is set to expand into Japan, New Zealand and Russian later this year. Apple SVP of Worldwide Marketing Phil Schiller detailed Apple Pay's Japanese launch onstage, noting iPhone 7, 7 Plus and Apple Watch Series 2 hardware will all be compatible with Japan's FeliCa NFC technology when they debut next week. The announcement confirms reports surrounding an impending entry into the Asian market earlier this month. Specifically, iPhone 7, iPhone 7 Plus and Apple Watch Series 2 models sold in Japan will support FeliCa Type-F NFC contactless technology, Apple said. 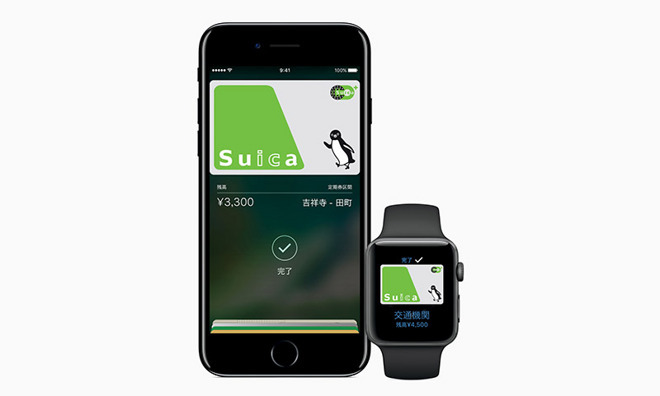 While a number of tap-to-pay services rely on FeliCa technology, Apple is touting initial integration with Suica transit cards from JR East. With Japanese transit data set to go live in iOS 10, commuters can use iPhone to plan and pay for their entire ride, as well as buy products from retail locations where Suica, iD or QUICPay are accepted, the company said. "We are incredibly excited to bring iPhone 7 to customers in Japan so they can experience the magic of Apple Pay," said Apple CEO Tim Cook. "Apple Pay will transform your daily routine, from making your commute easier and more convenient than ever with Suica right on your iPhone 7 and Apple Watch Series 2, to using your favorite cards to make secure and private purchases with a single touch." As noted by regional blog Ata Distance, JR East is planning to release a standalone Suica app for card management and recharging. The app will supposedly generate a virtual Suica card which links to credit and debit cards provisioned through Apple Pay. In Japan, Apple Pay is anticipated to debut in October with support for most Japanese credit and prepaid card brands, including those offered by AEON, Credit Saison, JCB, Mitsubishi UFJ Nicos, Orient Corporation, Sumitomo Mitsui Card, Toyota Finance, UC Cards and View Card. Cellular carriers KDDI, NTT Docomo and Softbank are also included in the list of supported issuers. Apple's online Apple Pay variant will go live at the same time. Apple Pay is also expected to launch in New Zealand sometime this fall. A report from Stuff pegs a start of services in October through a partnership with ANZ, which in April became the first of Australia's big four banks to adopt Apple Pay. "Our customers in the nine markets around the world where Apple Pay is live today love how convenient it makes their day-to-day shopping, and we can't wait to bring Apple Pay to New Zealand so customers there can start making easy, secure and private payments in their favorite stores, apps and on the web," said Apple Pay chief Jennifer Bailey. Apple is slated to activate Apple Pay services in Russia as well, though a firm launch timeline has not been announced. After launching domestically in 2014, Apple Pay has expanded to cover nine markets including Australia, Canada, China, France, Hong Kong, Singapore, Switzerland and the U.K.